did not show him as particularly appreciative of Armenians. This makes his testimony more compelling and trustworthy. Nogales (his birth name was Rafael Inchauspe Méndez) was born in San Cristóbal, state of Táchira, on October 14, 1879. His father sent him to Europe, where he studied in Germany, Belgium, and Spain, and spoke German, French, and Italian fluently. The thirst for adventure and the attraction of the military profession turned him into a soldier of fortune from the late nineteenth century. In 1898 he fought with Spain during the Spanish-American War. He returned to Venezuela in 1901, but he was critical of Cipriano Castro’s dictatorship. In 1902 a revolution started and Castro tried to have him arrested, but Nogales escaped to Nicaragua, where President Zelaya supported him in a failed expedition to overthrow the Venezuelan dictator. After spending time in Mexico, where he enjoyed the protection of another dictator, Porfirio Díaz, he went to China and then he was involved as a double spy in the Russo-Japanese war. In 1904-1905 he mined gold in Alaska. Then he returned to California, where he fought along the forces of Mexican revolutionary Ricardo Flores Magón. After the military coup of Juan Vicente Gómez in Venezuela, which overthrew Castro’s dictatorship, Nogales returned to his homeland (1908). He was appointed governor of the state of Apure, but two months later he made himself an enemy of the new president and had to go into exile. He tried to join the French army at the outbreak of World War I, but he refused to renounce his Venezuelan nationality. In the end he enlisted in the Ottoman Army and was assigned to the Caucasus Front, where he reached the rank of major. 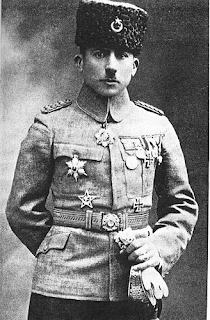 During the siege of Van in April-May 1915 he led gendarmerie troops, but asked to be relieved for what he characterized as “unjustified massacres of Christians.” He wrote that the massacres were executed by Halil Bey, the commander and chief of the expeditionary army he had volunteered to serve. (Halil Bey was Minister of War Enver Pasha’s uncle.). Nogales visited Diarbekir (Diyarbakir) in June 1915, and was a witness to the widespread massacres of the local Armenians. According to his conversation with Governor Mehmet Reshid, the orders to massacre had been sent by Interior Minister Talaat Pasha. The Venezuelan soldier was transferred from the Caucasus and continued fighting in Mesopotamia and Palestine. He was awarded the Iron Cross by Kaiser Wilhelm II of Germany and earned several Ottoman medals. After the end of the war, Nogales worked with Nicaraguan revolutionary Augusto César Sandino and wrote Spanish books, including his memoirs of World War I, Four Years beneath the Crescent (1924), translated into English and German, The Robbery of Nicaragua (1928), and Memories of a Soldier of Fortune (1932). After the death of Gómez, he returned to Venezuela and was appointed to study the army of Panama, but died in Panama City on July 10, 1936.